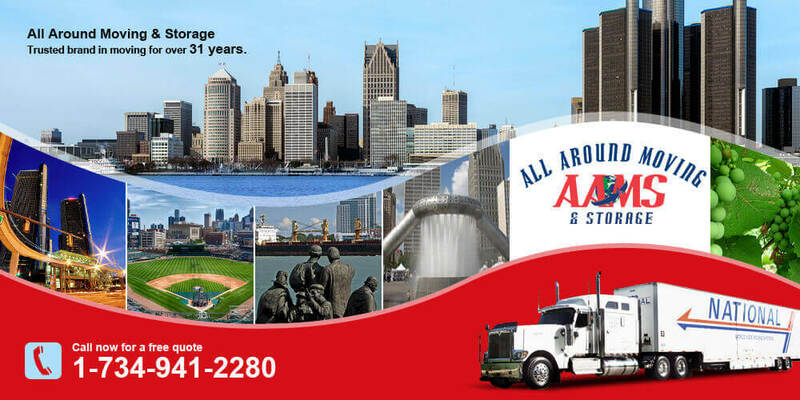 All Around Moving & Storage is proud to serve the Detroit area with premium moving services, including international and local moves. Our team offers honest, reliable, and professional movers in Detroit to help with every aspect of the relocation process. From a typical home to businesses and even industrial moving, packing, and storage, we can do it all. Our Detroit movers understand that until you get to fully know your way around a new area, relocating can be quite stressful. This guide will help to get you acquainted with Motor City. Detroit is the most populous city in Michigan and the biggest city that sits on the U.S.-Canada border. While it saw a bit of a downturn during the 2008 economic crisis, it has definitely made a turn for the better. Between the many plants in the area and the love for the local sports team, there are plenty of things to do and see in Detroit. Our team of movers in Detroit loves helping people who are coming to the city. We are excited to share our Detroit knowledge and experiences with the newest residents. Our guide to this great city can be found here. Each area in Detroit may require certain permits or have certain rules for the where you can park the moving truck. This means you need to call and check with parking services ahead of time at (313) 224-1610. The good news is that there are quite a few options in terms of transportation throughout Detroit. The DDOT Bus, People Mover, and Metro Lift are available throughout the city to help you get where you need to go. If you need help to get to your place of employment, the JARC/New Freedom transportation service should be contacted. All of the transportation schedules can be found online at the City of Detroit’s website. Regardless of why you moved to Detroit, there is likely going to be a time when you need to get somewhere else. Whether it is for business or pleasure, knowing the travel times for some of the most popular destinations can be extremely helpful. There is no question that you will want to explore your new home soon after arriving. There are quite a few things to do and see, so making a plan is a good idea. Detroit is divided into five different areas, including Dearborn/Wayne, Downtown Detroit, Greater Novi, Macomb, and Oakland. You can find everything from lively urban areas to wide-open scenic areas. If you are worried about getting lost or not being able to find some of the attractions you would like to experience, you can utilize the interactive map of metropolitan Detroit. This will help you find some of the most exciting areas in the city. When you are looking for a relaxing day of shopping, Detroit definitely doesn’t disappoint. The Royal Oak shopping center offers access to all types of boutiques, stores, and antique shops and is found on the outskirts of the city. Other shopping areas to consider visiting include Birmingham Shopping District, Somerset Collection, and the GM Renaissance Center. Calling our movers in Detroit will allow you to get settled and comfortable in your new home. Our team can not only provide you with reliable and professional international moving services, they can also provide you with practical advice regarding where to eat, directions, and other helpful information. When it comes to your relocation needs, finding quality Detroit movers is essential. Our team is ready to assist you in any way possible to make your move and relocation as stress-free as possible.